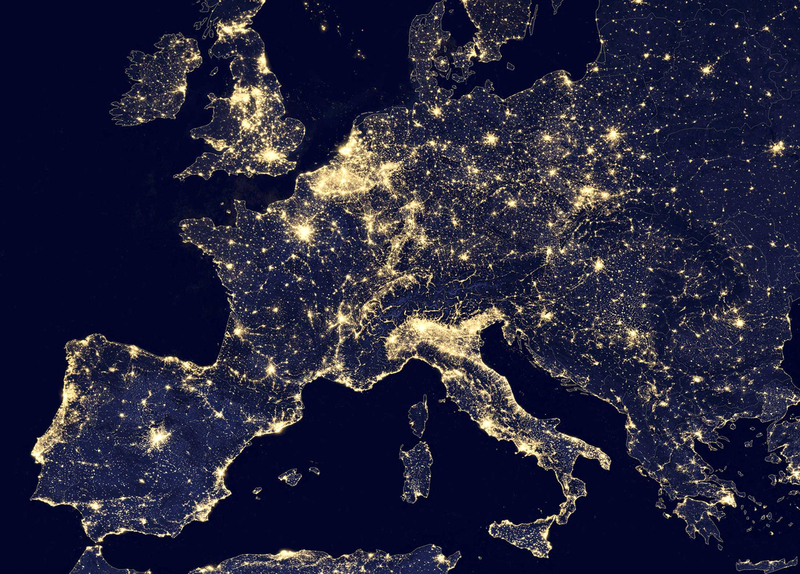 Address: Via di Settebagni, 376, Rome, Italy. “They would say things like, ‘How great it is to be in the Lord’s vineyard, and labor and see a stake created. And see the temple start to be built. '” Pacini paraphrased. Religious Persecution in Rome: The execution of those that did not follow the practice of the Roman beliefs. This went on, sporadically, for 50 years, targeting the Bacchanals, Druids, Jews, and Christians randomly throughout history. Christians were severely tortured and killed for their beliefs in Rome. In order to understand the visions that have foreshadowed the growth of the Church in Italy today, we must first look back at history. One of the biggest historic moments throughout Italy was the religious persecution in the Roman Empire after Christ’s crucifixion. Those who did not follow the beliefs of the majority of Romans, were seen as a threat to the Roman Empire (more specifically as a threat to a Roman Emperor). Christians were seen as cannibals, because of their symbolic partaking of the sacrament, representing the body and blood of Christ. 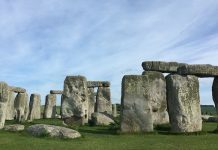 They were also viewed as atheist because they refused to bow down to the Roman Gods. This distaste towards Christians was not a universal feeling among all Romans. It was mostly expressed through one emperor: Nerō Claudius Caesar. Nero, the Roman Emperor from 54-68AD, was believed to have started the Great Fire of Rome, which he then blamed on the Christians; supposedly vindicating the torture and executions that followed. 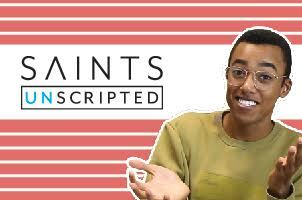 Saints who stood up for their faith were seized, convicted, and then punished severely. Their execution was turned into a game. Some were covered with the skins of beasts, and eaten alive by dogs. Others were nailed to crosses, like Christ, or set aflame and used as night-time lamps. One of those murdered by crucifixion was Peter, the apostle. He considered himself unworthy to experience the same death as Christ, and requested to be crucified upside down. Another apostle that was beheaded in this religious persecution was Paul, a Roman citizen. There is an estimate of 100 thousand members of the Church that were butchered throughout the Circus Maximus, Nero Circus–where the Vatican is located–and other places throughout the Roman Empire. “Tens of thousands of faithful saints died for their testimonies in Italy.” Pacini reaffirmed, with rising emotion in his throat. 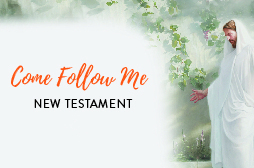 In the Fall of 1850, Elder Lorenzo Snow traveled into Italy with two other companions to introduce the restored Gospel into the valleys of Italy. In the early months of his mission, he wrote a letter to Brigham Young, from Piedmont, reporting on his arrival into Italy and the big task that lay ahead of him. After ascending a mountain and spending hours in prayer with his fellow Elders, they started to see progress and acceptance from some of the Italian people. Seven months later, Lorenzo Snow left to England to oversee the translation and publication of the Book of Mormon in the Italian language. Before leaving Turin, Italy he wrote a letter to President Hyde regarding his leaving and reflecting on the Italian country and the past persecution of the saints and future of the Church in Italy. Even during this time, as in the time of Nero, the Protestants and Papists looked at each other as outcasts, but saw themselves as the favorites of heaven. O, Italy!…The future of thy story shall outshine the past, and thy children shall yet be more renowned than in the ages of old. Many would say that Lorenzo Snow’s words reflect the progress of the Gospel to this great time of their first Latter-day Saint temple. Fast forward 160 years later, to the groundbreaking of the Rome Temple. Elder Kopischke, the Area President who spoke at the groundbreaking, shared a story about President Ezra Taft Benson, 13th President of the Mormon Church. This story alone foreshadows the growth of the LDS church and temples not only in Italy, but many other countries in Europe. President Pacini reflected on this quote from President Benson’s dream, and shared the following idea that this temple is not the only blessing that we will see throughout the world. Current LDS numbers in Italy: 10 stakes and 26,550 members. 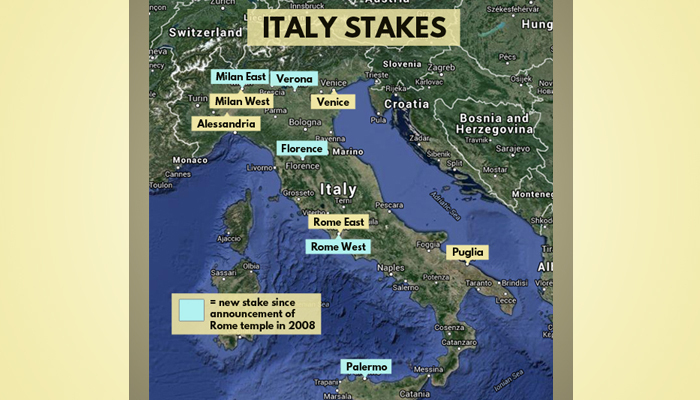 5 out of the 10 stakes in Italy were added after the temple announcement in 2008. Many believe that the development of the temple has a lot to do with this growth. Vincenzo is confident that the temple has helped to increase the participation and involvement of members. “Everybody is awaiting the [building of this] temple that there is so much excitement and there is more of a desire to do work.” Vincenzo said with gusto and a slight quiver in his voice. From a spiritual and practical level, President Dini Ciacci, the Stake President of the Rome West Stake, also believes that the temple has a lot to do with this growth. He says that, realistically, the temple has given the LDS Church a lot of publicity. Stake President Dini Ciacci presenting the temple draft to the Vice Mayor of Rome, Luigi Nieri. The day President Monson announced the temple, there was a subtle gasp and hush of voices in the Conference Center. The stake centers and homes in Italy were filled with much more than a rush of talking. As much as Dini Ciacci would like to say that the biggest struggle among the members has been the impatience for the temple to be completed, there has been a much bigger challenge for the members of Italy. 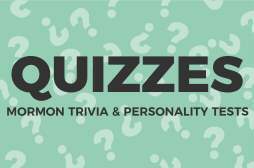 “For sure, we have seen the adversary working on couples and families. That’s the biggest challenge that I have seen,” President Dini Ciacci solemnly stated. Being a member, right now in Italy, means having a strong faith or you won’t make it. 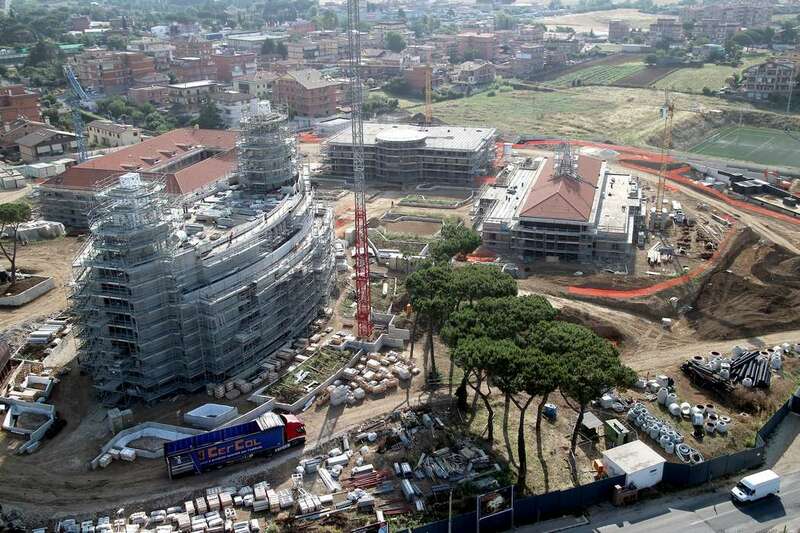 The Mormon Rome temple in the middle of construction. Despite this challenge among Italian members, there has also been a strong spiritual influence on non-members because of the temple. 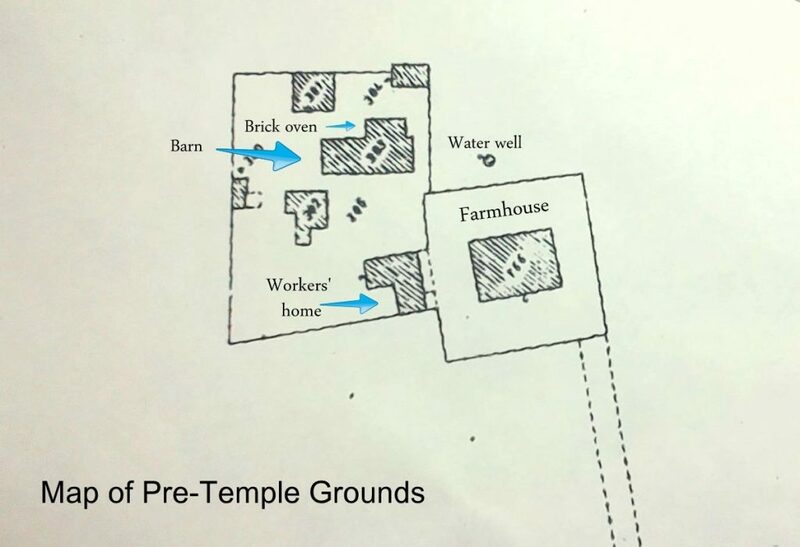 There are many non-member construction workers at the temple site, as well as missionaries at the temple site that help with translation and such. One specific senior construction worker asked the missionaries to teach him about the Mormon church. During the process of learning about the church, this construction worker received a testimony of the principles he was being taught and decided to be baptized into the LDS church. President Pacini remembers hearing about that same senior construction worker. His conversion was so upsetting to the construction company that they transferred him. They didn’t want it to become an example that the other workers would want to follow. The result: Another conversion. For other members of the Church, it has been a blessing to observe the General Authorities of the LDS Church when they come to visit the temple site. For Stake President Dini Ciacci, personally, it has been a blessing to tour the temple with the First Presidency, members of the Quorum of the Twelve, and other General Authorities. In October, President Henry B. Eyring joined together with the Pope and other religious leaders for a conference on marriage and family at the Vatican. That Sunday afternoon, President Dini Ciacci, his wife, and other leaders were invited to tour the temple with President Eyring. The temple even spurred a photo essay of Italian members in the Italian National Geographic. The Rexburg, Idaho Temple–one of the several temples that Leon Parson has painted a mural for. “Painting murals for a temple is a competition.” Leon Parson, the artist of the Rome Temple mural says. Parson is a North American wildlife artist, a professor at BYU-Idaho and has been selected to paint murals that adorn the walls of several temples including the Rexburg, Twin Falls Idaho, and Calgary Alberta Temples. The process of applying for the opportunity to be an artist for a temple mural is very specific and tedious. Each artist designs and paints a mock-up, or a scaled version of what their mural would look like if they were to be given the assignment. Along with the mock-up, each artist is to estimate a financial bid for all of the expenses from the cost of linen canvas, paint, supplies, to the cost of travel (if necessary). 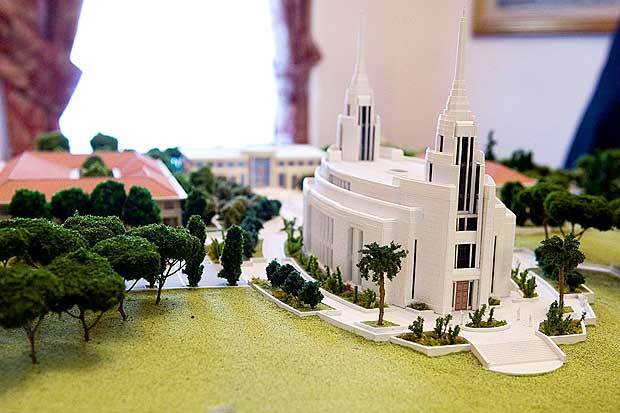 The mock-ups and financial estimates are then sent to the Temple Department in Salt Lake City, UT. Each artist’s work is reviewed by a Temple Art Committee. 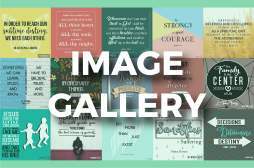 Then, after selecting the artist, they send his work to the Presiding Bishopric and to the member of the Quorum of the Seventy who has responsibility over the temples. 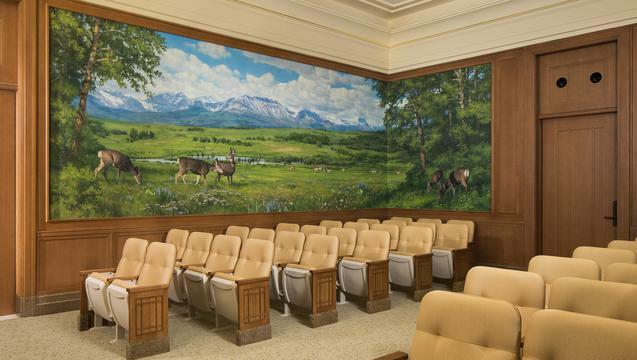 If they approve, then the artist’s work will go to the First Presidency who make the final decision to assign the mural to that particular artist. While working on the mock-up of his mural, Parson realized that he was provided with a few big blessings: Nadine Haderlie, Terry Madsen, Denis Modugno, and Elder Kent Allen. Nadine Haderlie is a returned missionary from Italy who loves Italy and the Gospel very deeply. She connected Brother Parson to Terry Madsen, who also served in Italy the same time as Sister Haderlie. Madsen, a student in Parson’s class over thirty-two years ago, as well as an accomplished photographer, had taken six previous trips to Italy. “Her photo images [of Italy] were extremely helpful in getting the assignment.” Parson said. Denis Modugno, a native Italian from Rome (and the son of Vincenzo Modugno), was also a student in Parson’s class the semester before he proposed to do the mural. Parson approached Denis and asked for his feedback on the best way to depict Italy in a single mural. You know Bro Parson, Italy is 80% sea coast. [People] sometimes go to the mountains for vacations, but most of the time it is to the sea. Parson quickly changed the design from the Italian Alps to the seacoast, which seemed to have been the deciding factor between him and his other competitors. The final big blessing was Elder Kent Allen, a returned missionary who had served in Italy. He was able to assist Parson on a trip to Italy, where they would be hosted by Vincenzo Modugno. “[Vincenzo] set up an action-packed, fantastic tour of Italy. [We went] from a wildlife preserve to photograph Roe deer, to a private boat journey off the seacoast near Naples. We came home with approximately 3,500 photos in the 5 days there. It was marvelous.” Parson stated with unmasked enthusiasm. Parson is 85% finished with the temple mural and expects to be finished in April 2015. While he does not plan on attending the open house, Parson looks forward to flying to Rome to supervise the installation of the mural. The Switzerland Temple and current district temple for Italian members. “For years, the members in Italy were waiting for the temple.,” Vincenzo Modugno says. 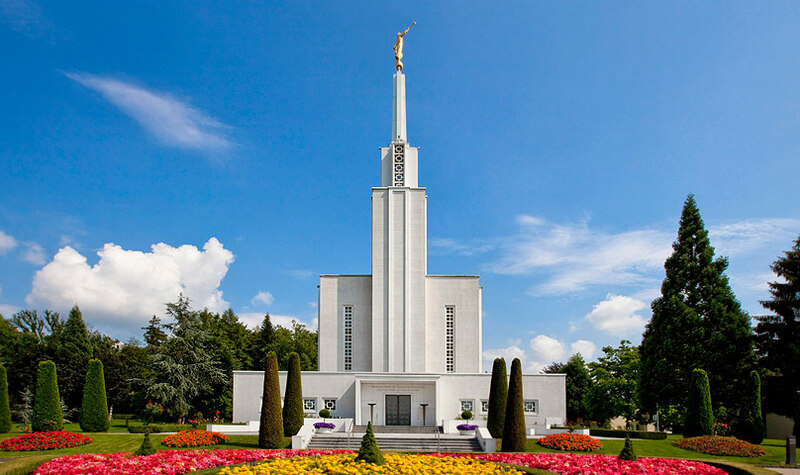 The closest temple for most Italians is the Bern, Switzerland temple. For most Romans, that is a ten-hour drive, but for many coming from the south, the journey can take more than twenty-four hours. The boat trip, alone, from Sardinia to Italy can take thirteen hours. Despite the distance, many Italian members make time to attend the temple regularly. “I was told that [almost] 90% of the [temple] work done inside the Switzerland temple is [done by] Italian members.” Modugno says. Although we are not certain of this statistic, it certainly expresses the sacrifices that Italian members make in order to help with the work of the Lord. “The feelings they have to serve in the temple, and…for a temple [to be built] are so strong. The feelings [are] so strong.” Modugno says. The Rome temple district may include those from nearby countries such as North Africa, Greece, the Middle East, Albania, the Balkans, and many others. 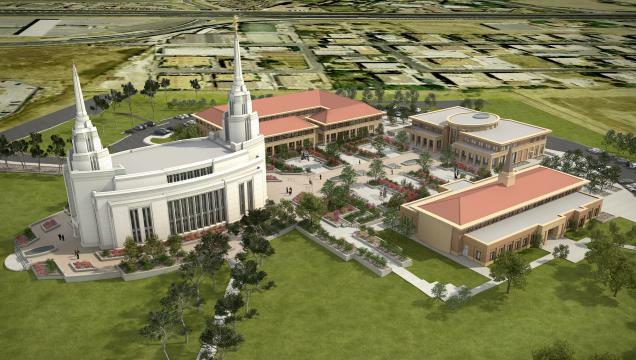 The Rome Temple districts have yet to be officially announced. 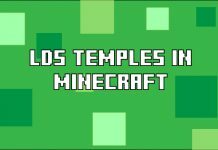 This temple is not just an advantage to the Italian members, but to many from nearby countries and islands. 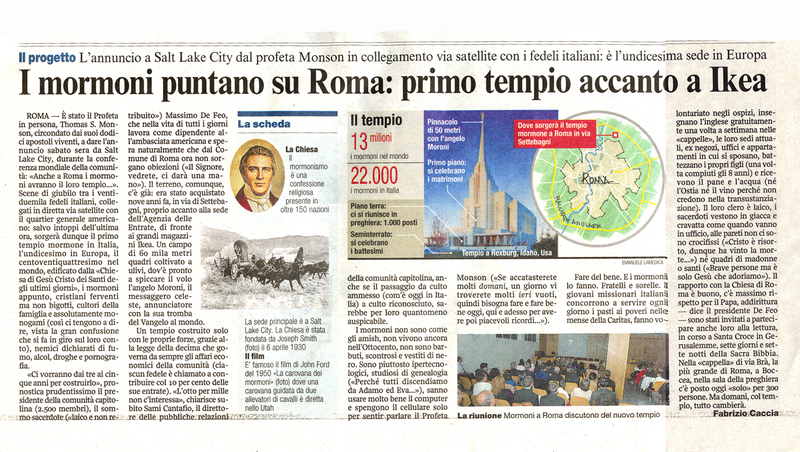 An Italian news article about the announcement of the first Mormon Rome temple as well as clarifying some of the LDS values. “At the beginning, they were very frustrated about it.” Vincenzo Modugno said. Non-members living in the area of the temple tried to stop the project at first. “They made some declaration to the mayor or some demonstration [expressing] that they didn’t want the temple in that area.” Modugno said. Many were afraid of the overpopulation of tourists and members visiting the temple. Now that non-members have a better understanding of the project, the objections have calmed down completely. Vincenzo Modugno, personally, has never had anyone say anything rude to him regarding his religion or the temple. “I think that non-members are curious about [the temple] and stake presidents are working to [inform] them about it,” Modugno explained. Another conflict that has been suggested by other articles is that of religious interference. From the very beginning, the Catholic church has been very open and supportive of the LDS church building the temple. As an act of courtesy, the temple project was presented officially to the Catholic church to fully inform them, “as neighbors do with neighbors” Dini Ciacci said with a smile. Pacini agrees that there was never an issue between the Catholic church and the Mormon church. The building of the temple never posed a problem for ecumenism. “The Catholic church has never had any problems with [the temple].” Pacini said, matter-of-factly. As many may already know, the Catholic church in Italy runs a lot of shelters and soup kitchens. A few months ago, the main soup kitchen in Rome needed some remodeling. One Saturday morning, forty members from the Rome stakes gathered together to take down, paint, and clean the entire serving area. They also donated new tables, chairs, and replaced the old furniture. 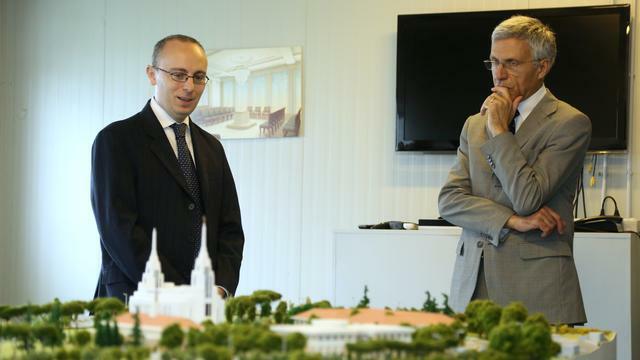 President Alessandro Dini Ciacci, currently the Stake President of the Rome West Stake is fully aware of the delay of the temple being finished. “Of course there have been some delays,” stated Dini Ciacci in a private interview. It was announced in a promotional video by the church, that the temple was expected to be completed by 2014. Now in 2017, the Rome temple is still not finished and has experienced some contract issues. However, work is currently underway and back to normal again. “We can see the finish line, but we don’t know how long it will take to get to the finish line yet,” President Dini Ciacci says. The temple is estimated to be completed in mid-2018, although no official dates have been announced. 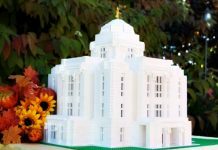 Usually six months before the opening of the temple, the date will be announced publicly through the Church’s official channels. What are your thoughts on all of these events following the building of the Rome temple? Do you have any stories to add? We would love to hear about them in the comment section below. Nicole is a Technical Writer from BYU-Idaho, working as a content writer for LDS.net. A California girl married to a native Italian, Nicole has become quite cultured in the last few years. She has hiked to the top of Half Dome once, traveled to Italy and Switzerland twice, loves to run, and believes in the power of lavender-salt baths and yoga.